December 3, 1937: Although she wasn’t a big star yet, Judy still had two films in circulation including the very high profile Broadway Melody of 1938. Both films were firsts for her. 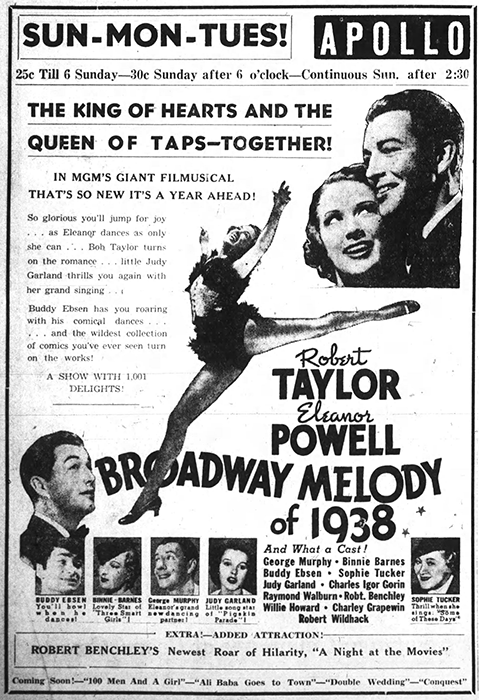 Broadway Melody was her first feature film for MGM and Thoroughbreds Don’t Cry was her first with Mickey Rooney. 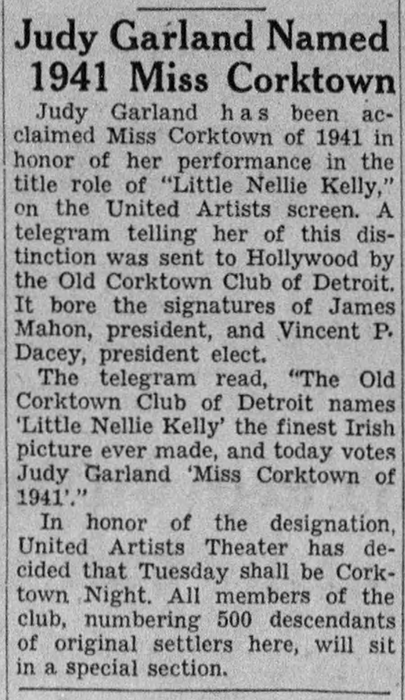 December 3, 1940: Judy was named “Miss Corktown of 1941” (Detroit, Michigan) by the Old Corktown Club of Detroit in honor of her performance in the title role of “Little Nellie Kelly.” A telegram was sent to Judy, probably via MGM Studios. 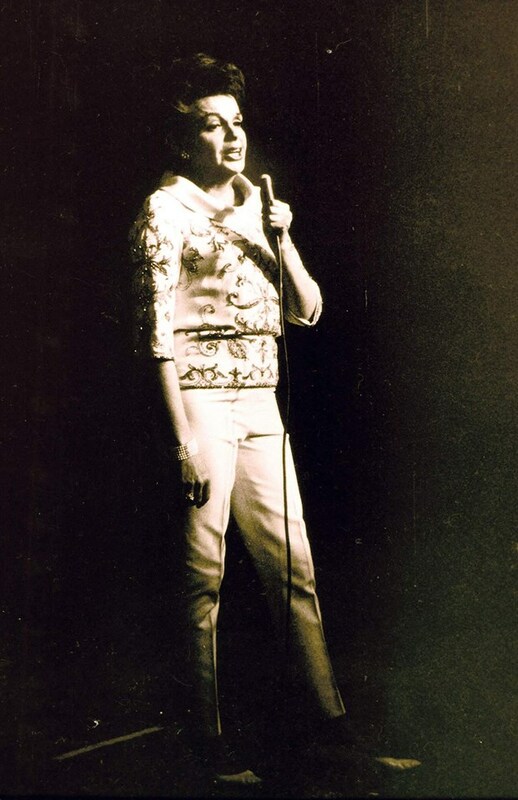 Hardly enough can be said for the cute, vivacious manner and appearance of Judy Garland, one of the screen and radio’s most sensational finds, and certainly not enough can be said of her voice … a voice that ripples in rhythm and is sweeter than the honey from the honey bee. You’ll think so too if you listen to her on Bob Hope’s program every Tuesday night at 9 o’clock over KTBS. 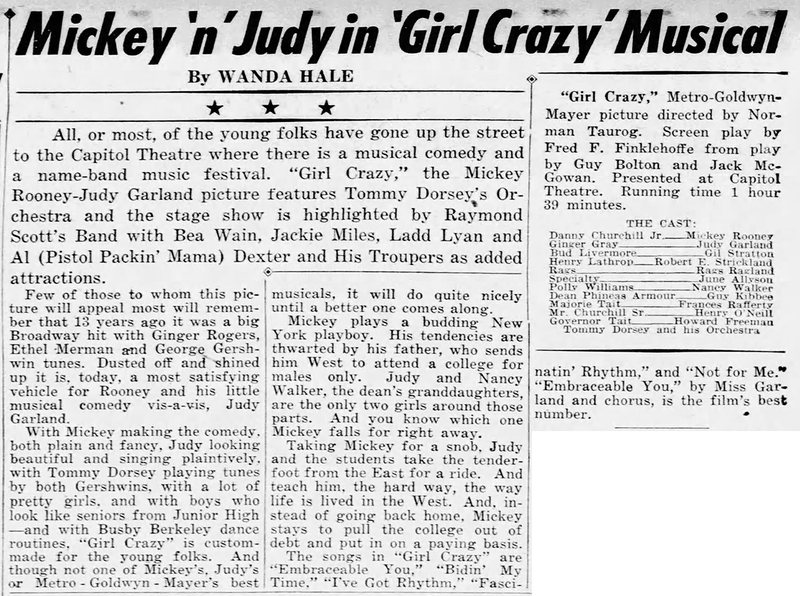 December 3, 1940: Although at this time most of the critics and columnists were referring to Judy as “lovely” this article about child stars out of Sydney, Australia, blatantly refers to Judy as “homely.” Two decades later Judy again wouldn’t fare well with the Australian press after a disastrous concert tour. 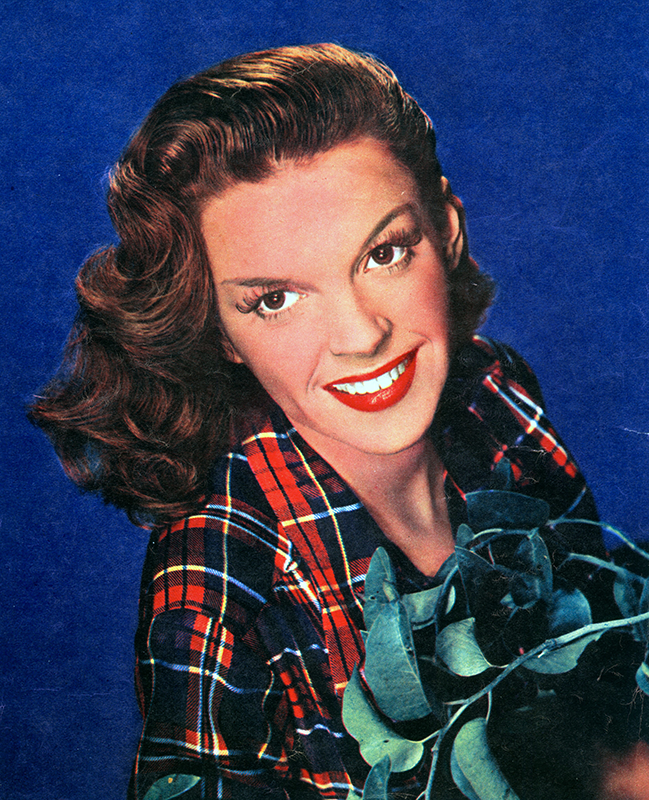 JUDY GARLAND is an example of adroit handling. 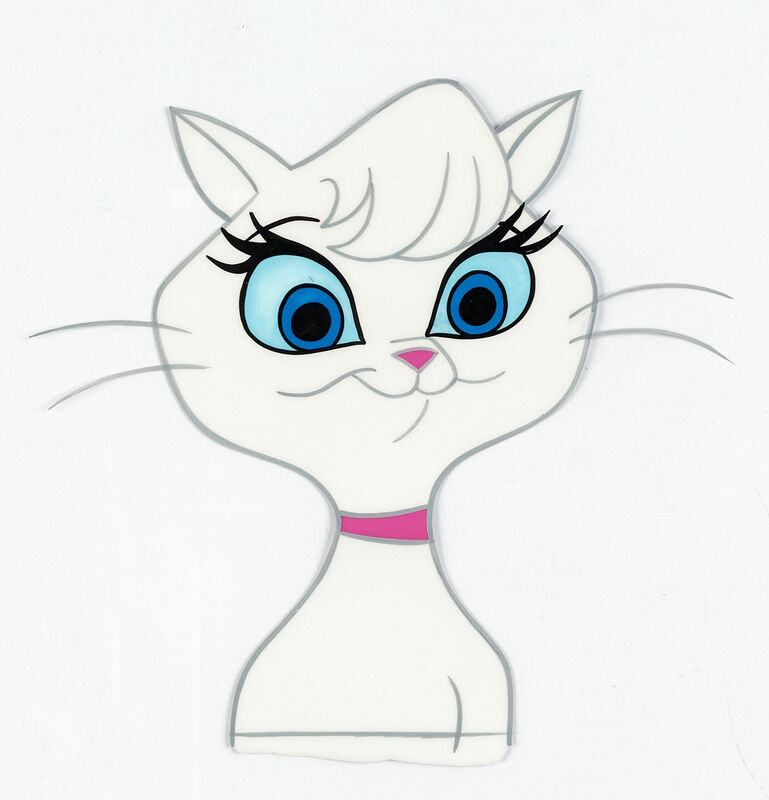 Judy is as plain as the girl next door, but because her studio writes her stories so that her roles are always sympathetic, and even suggests that Judy knows she is homely-looking, audiences have accepted her. Of course, her ability to swing a popular song has endeared her to the younger generation, especially the jitterbugs. 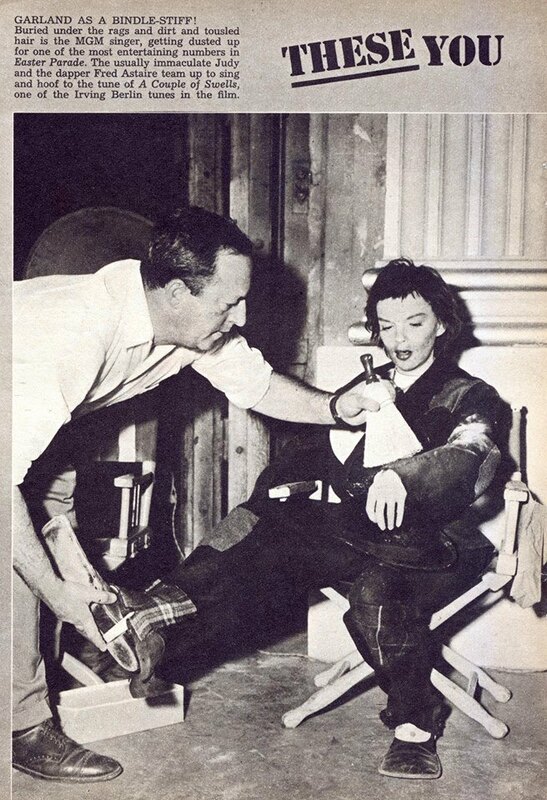 So long as the studio never tries to glamorise her, Judy will remain popular. 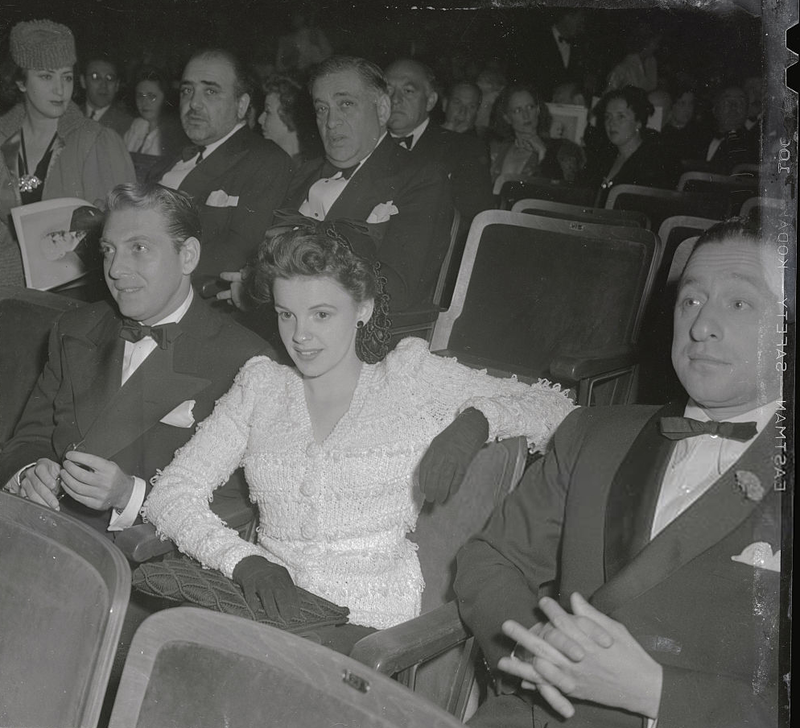 December 3, 1941: Judy, along with husband David Rose (left) and composer Harold Arlen (right) attended a benefit of U.S. medical aid to Russia at the Los Angeles Shrine Auditorium. The stars of the show were John Barbirolli, Jascha Heifetz, and Vladimir Horowitz. 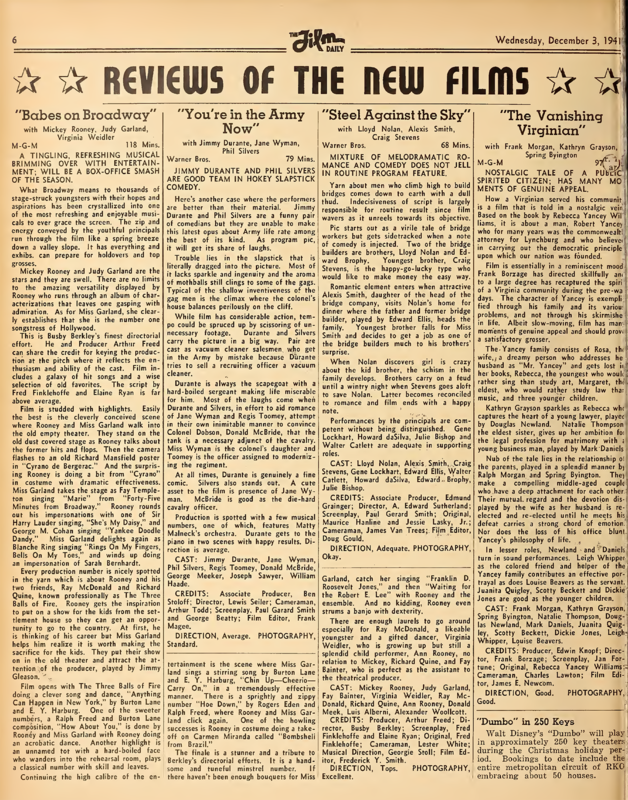 December 3, 1941: This review of Babes on Broadway was published in the “Film Daily” trade magazine. A TINGLING, REFRESHING MUSICAL BRIMMING OVER WITH ENTERTAINMENT; WILL BE A BOX-OFFICE SMASH OF THE SEASON. What Broadway means to thousands of stage-struck youngsters with their hopes and aspirations has been crystallized into one of the most refreshing and enjoyable musicals to ever grace the screen. The zip and energy conveyed by the youthful principals run through the film like a spring breeze down a valley slope. It has everything and exhibs. [exhibitors] can prepare for holdovers and top grosses. 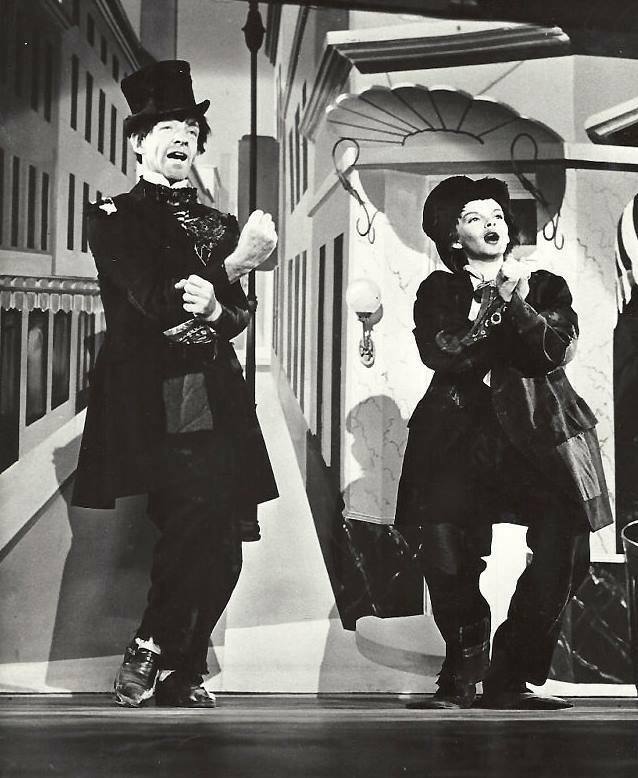 Mickey Rooney and Judy Garland are the stars and they are swell. There are no limits to the amazing versatility displayed by Rooney who runs through an album of characterizations that leaves one gasping with admiration. 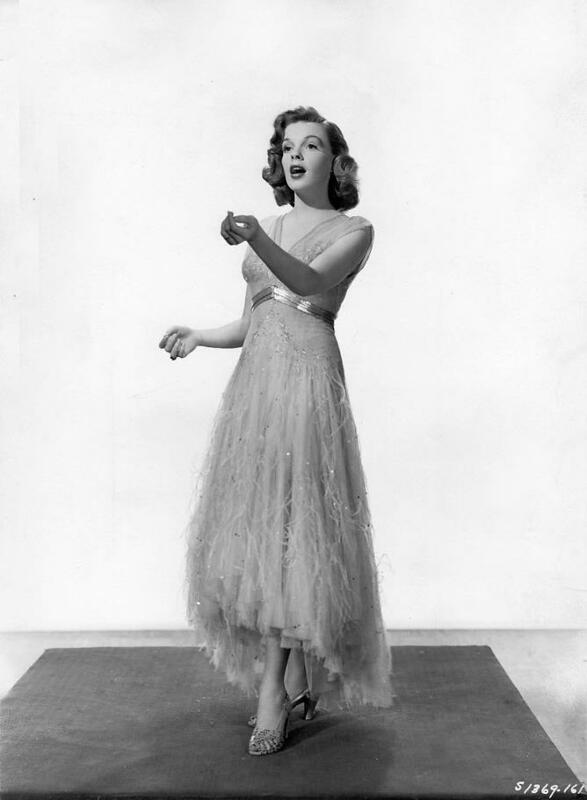 As for Miss Garland, she clearly establishes that she is the number one songstress of Hollywood. This is Busby Berkley’s finest directorial effort. He and Producer Arthur Freed can share the credit for keying the production at the pitch where it reflects the enthusiasm and ability of the cast. Film includes a galaxy of hit songs and a wide selection of old favorites. The script by Fred Finklehoffe and Elaine Ryan is far above average. Film is studded with highlights. Easily the best is the cleverly conceived scene where Rooney and Miss Garland walk into the old empty theater. They stand on the old dust covered stage as Rooney talks about the former hits and flops. Then the camera flashes to an old Richard Mansfield poster in “Cyrano de Bergerac.” And the surprising Rooney is doing a bit from “Cyrano” in costume with dramatic effectiveness. Miss Garland takes the stage as FAy Templeton singing “Marie” from “Forty-Five Minutes from Broadway.” Rooney rounds out his impersonations with one of Sir Harry Lauder singing, “She’s My Daisy,” and George M. Cohan singing “Yankee Doodle Dandy.” Miss Garland delights again as Blanche Ring singing “Rings On My Fingers, Bells On My Toes,” and winds up doing an impersonation of Sarah Bernhardt. Every production number is nicely spotted in the yarn which is about Rooney and his two friends, Ray McDonald and Richard Quine, known professionally as The Three Balls of Fire. Rooney gets the inspiration to put on a show for the kids from the settlement house so they can get an opportunity to go to the country. At first, he is thinking of his career but Miss Garland helps him realize it is worth making the sacrifice for the kids. 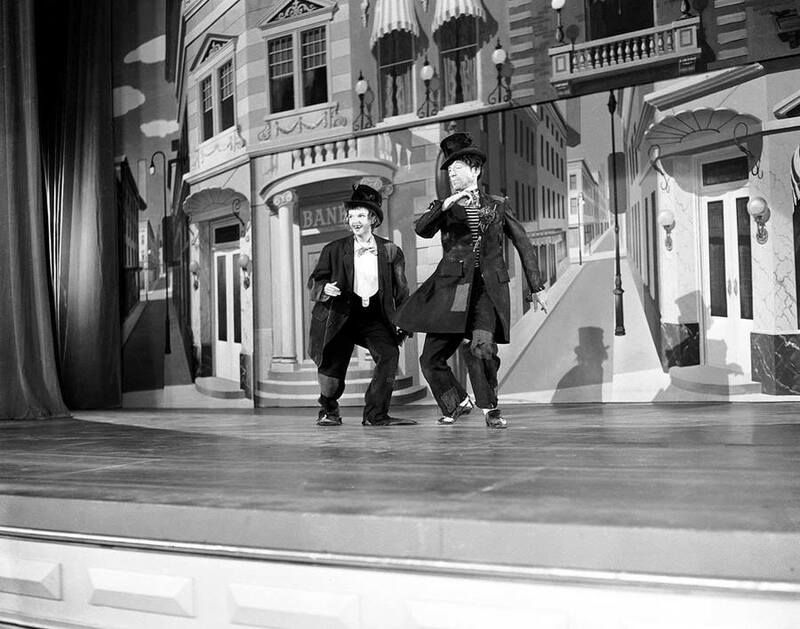 They put their show on in the old theater and attract the attention of the producer, played by Jimmy Gleason. 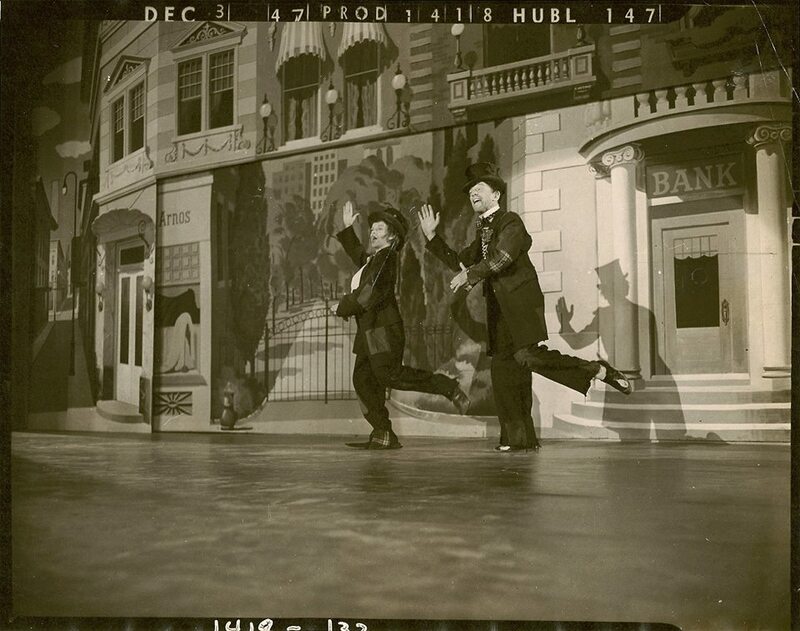 Film opens with The Three Balls of Fire doing a clever song and dance, “Anything Can Happen in New York,” by Burton Lane and E.Y. Harburg. 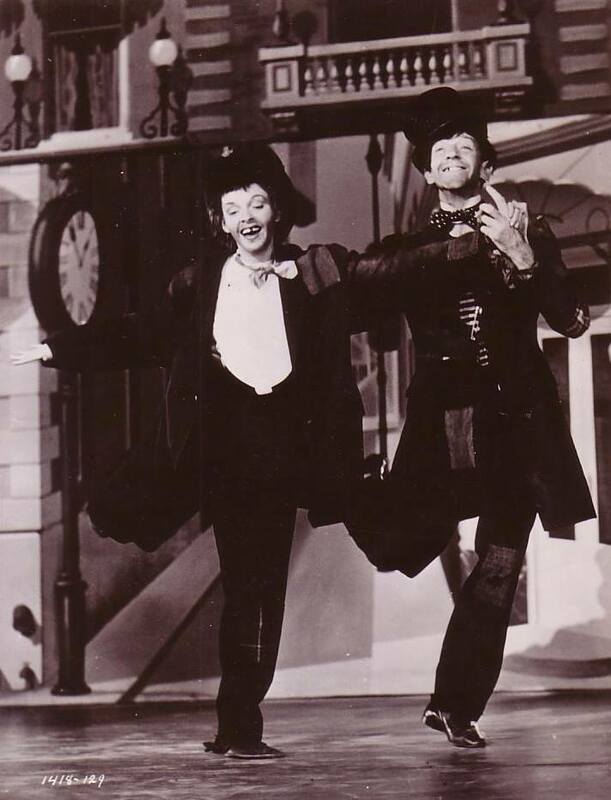 One of the sweeter numbers, a Ralph Freed and Burton Lane composition, “How About You,” is done by Rooney and Miss Garland with Rooney doing an acrobatic dance. Another highlight is an unnamed tot with a hard-boiled face who wanders into the rehearsal room, plays a classical number with kill and leaves. The finale is a stunner and a tribute to Berkeley’s directorial efforts. It is a handsome and tuneful minstrel number. If there haven’t been enough bouquets for Miss Garland, catch her singing “Franklin D. Roosevelt Jones,” and then “Waiting for the Robert E. Lee” with Rooney and the ensemble. And no kidding, Rooney even strums a banjo with dexterity. 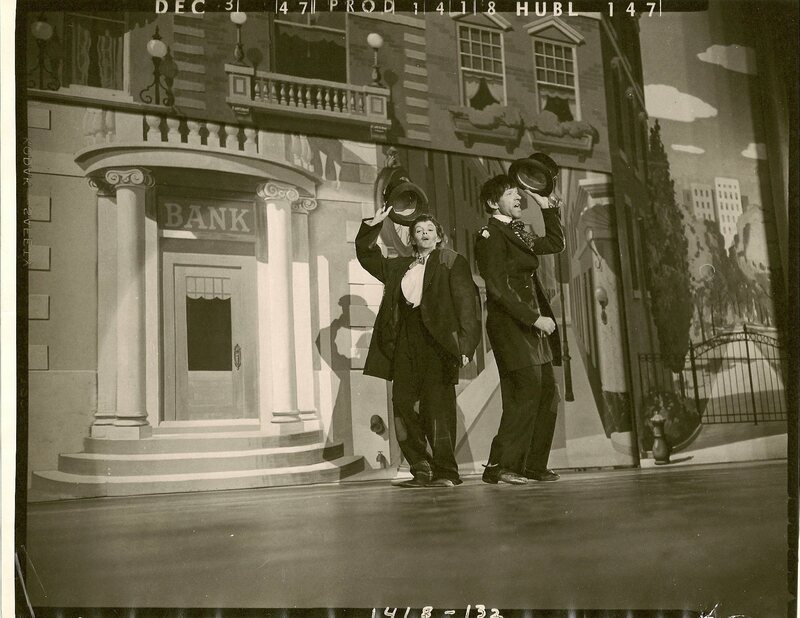 There are enough laurels to go around especially for Ray McDonald, a likable youngster and a gifted dancer, Virginia Weidler, who is growing up but still a splendid child performer, Ann Rooney, no relation to Mickey, Richard Quine, and Fay Bainter, who is perfect as the assistant to the theatrical producer. 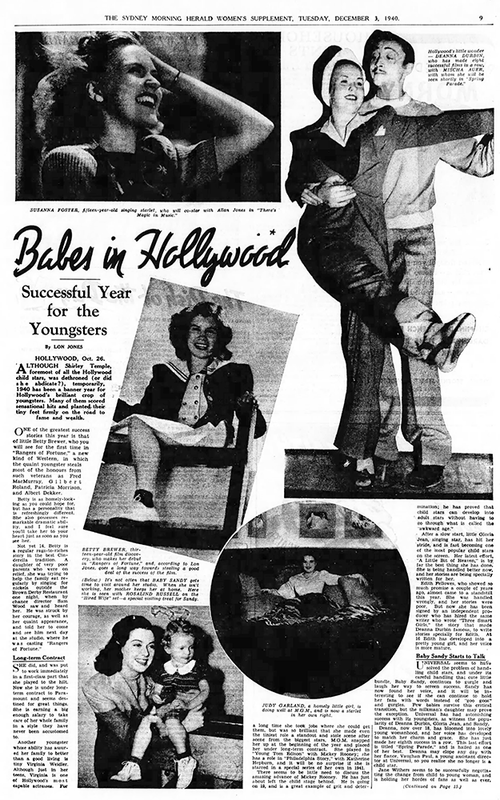 December 3, 1943: More accolades for Girl Crazy. 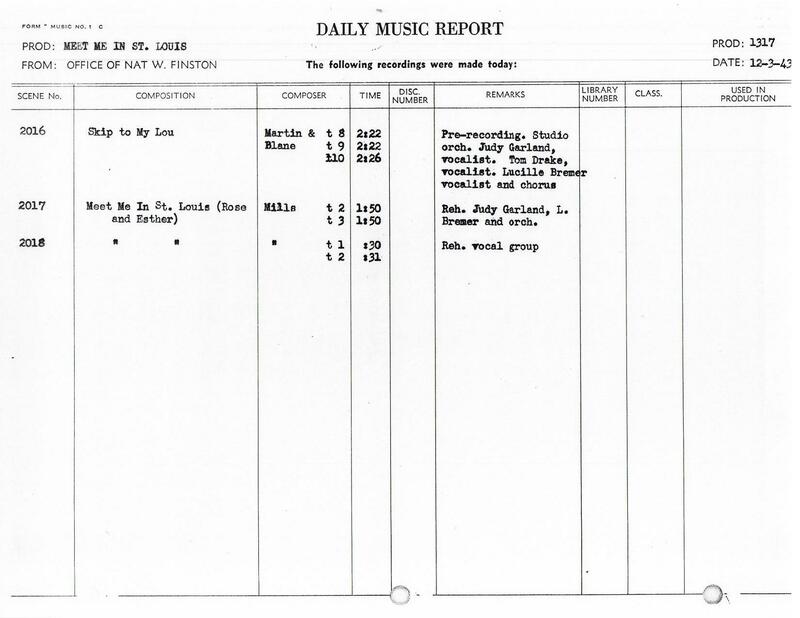 December 3, 1943: Another recording session for Meet Me In St. Louis. 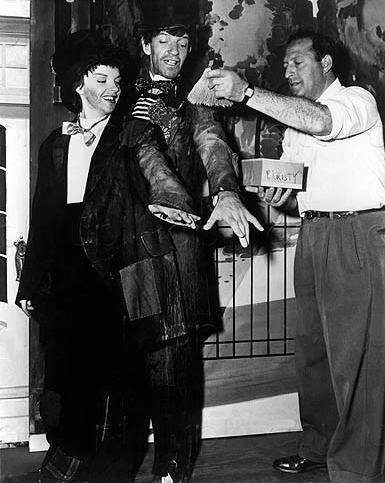 Judy pre-recorded “Skip To My Lou“ and “Meet Me In St. Louis” with Lucille Bremer, Tom Drake, and the MGM Studio Chorus. 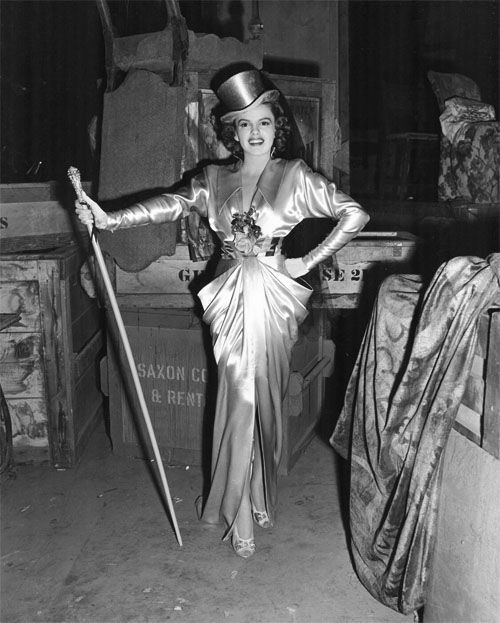 She also rehearsed “Under the Bamboo Tree” (without Margaret O’Brien who would not be in the recording studio until the 17th when the song was recorded). The rehearsal was not recorded. 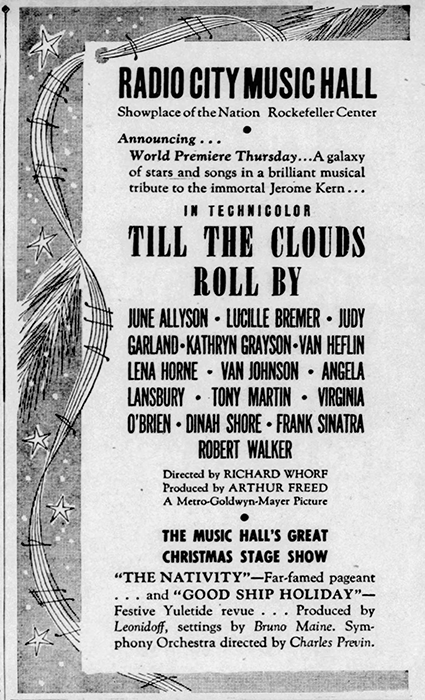 December 3, 1946: In just a few days, the world premiere of Till The Clouds Roll By at New York’s famed Radio City Music Hall. 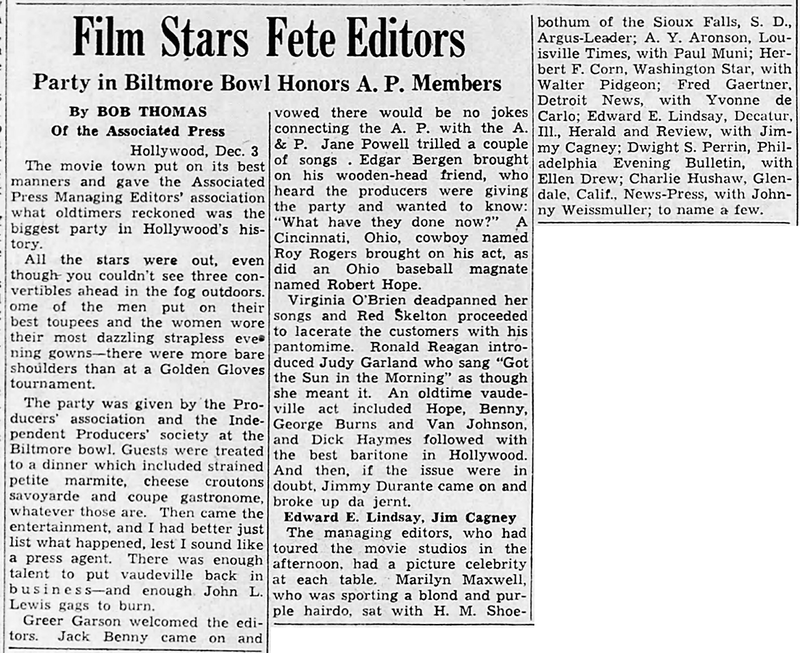 December 3, 1946: Judy was one of many stars who recently took part in a party for the Associated Press Managing Editors’ Association at the Biltmore Hotel in Los Angeles, California. 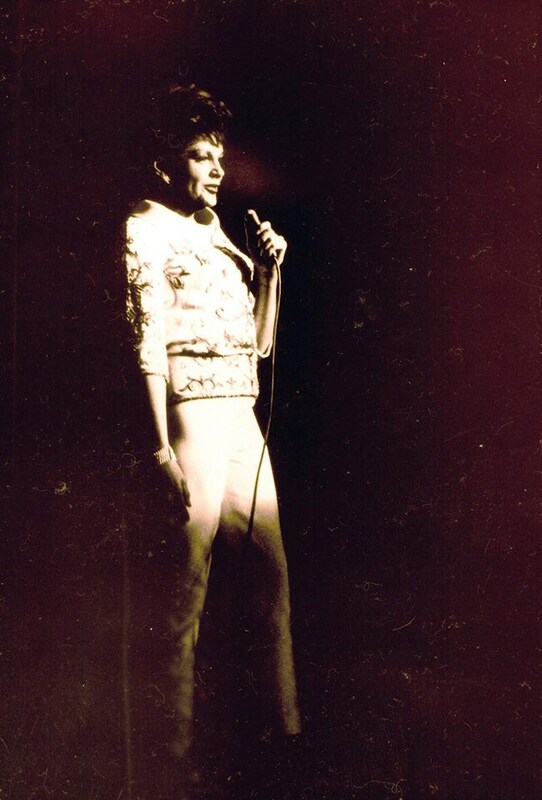 Judy sang “I Got The Sun In The Morning” “as though she meant it.” No recording of this event is known to exist. 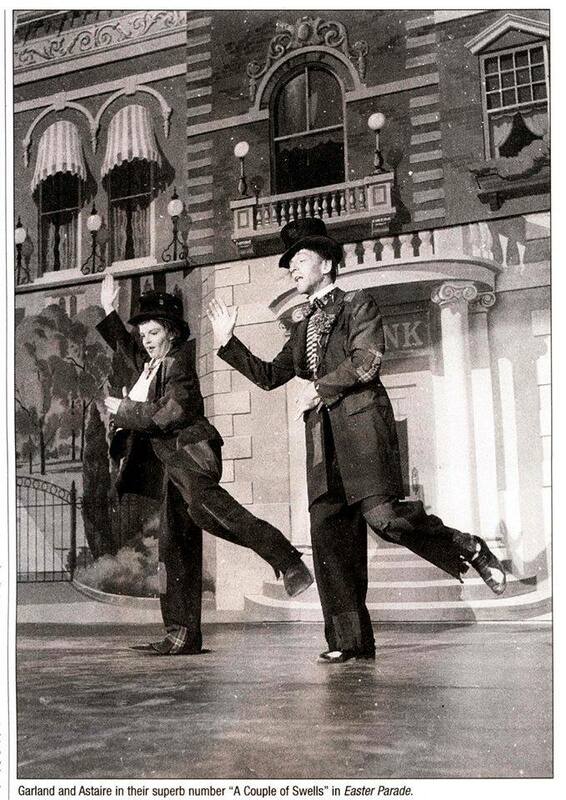 December 3, 1947: The first of two days of filming for Judy and co-star Fred Astaire on the “Interior Globe Theater” set for Easter Parade – the now-famous “A Couple Of Swells” number, which is one of the best numbers Judy (and Fred) ever put on film. Thanks to Kim Lundgreen for providing most of the photos. Thanks, Kim! 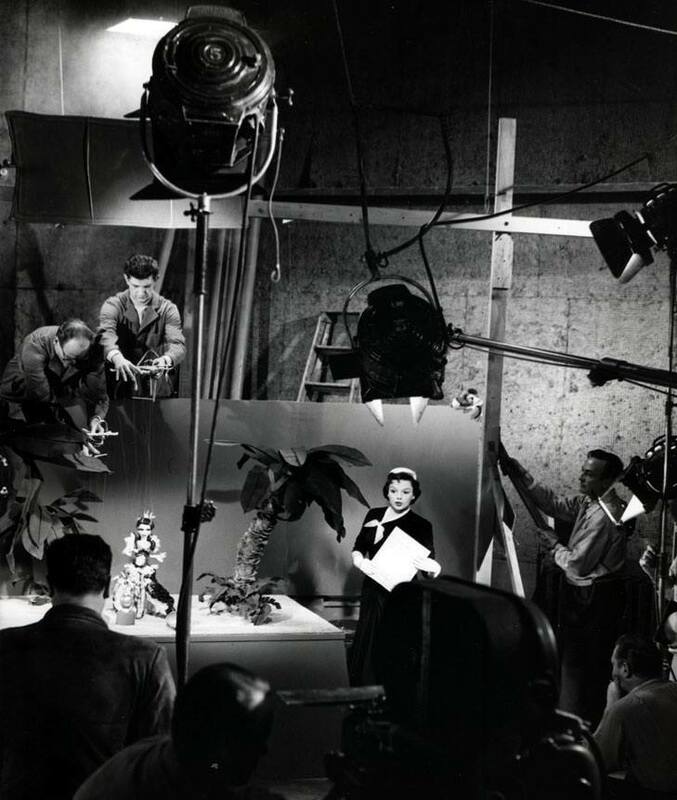 December 3, 1953: A Star Is Born filming consisted of the scene on the ‘Interior Television Commerical” set. 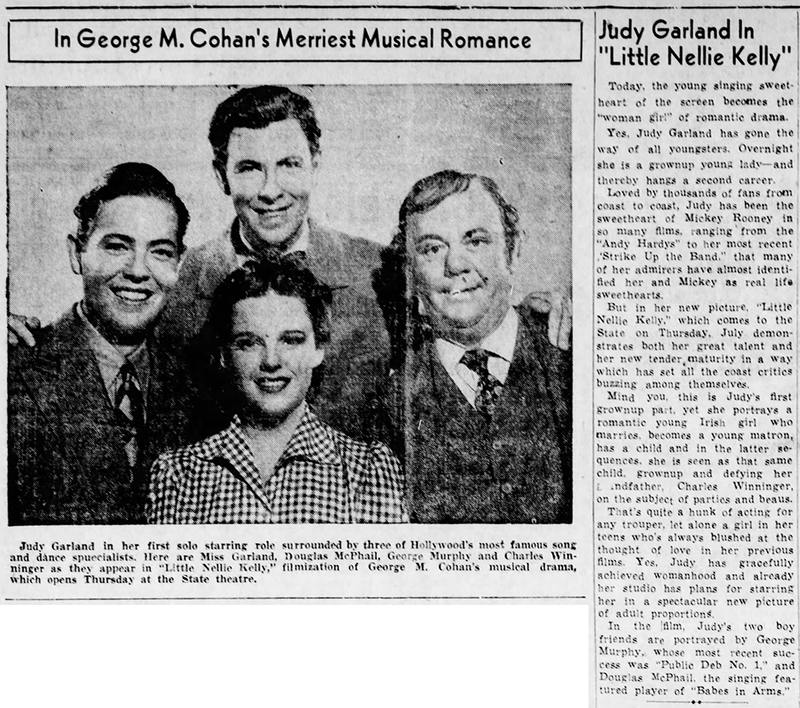 Time started: 10 a.m.; finished: 5:35 p.m.
JUDY GARLAND got a fan letter from a lady in Ohio: “My dear husband just died. I hope you don’t mind, dear Judy, but I played his favorite Garland recording at his funeral – ‘The Man That Got Away. '” I’m not being morbid and I’m not making it up. Judy really got the letter. If Judy really did get this letter, she must have howled with laughter! 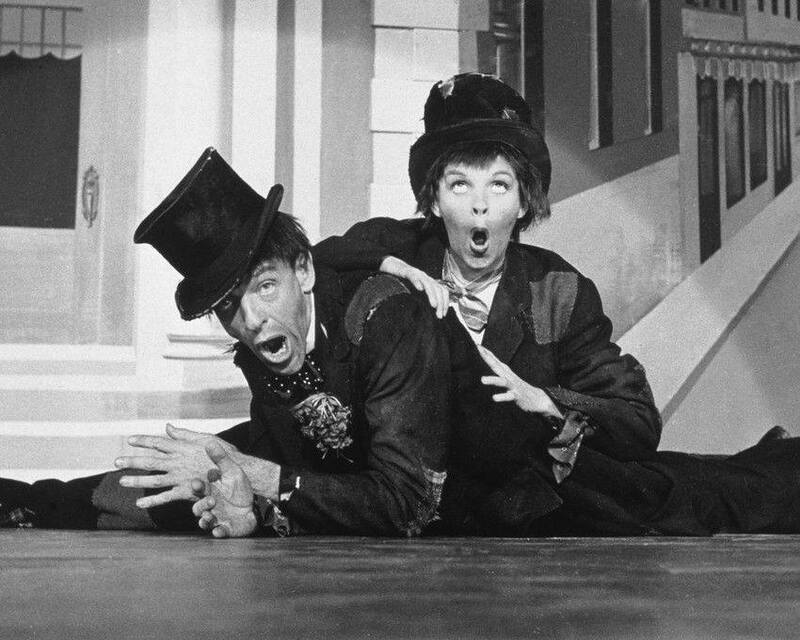 December 3, 1960: Fans in the Chicago, Illinois, area were treated to a special TV showing of For Me And My Gal. 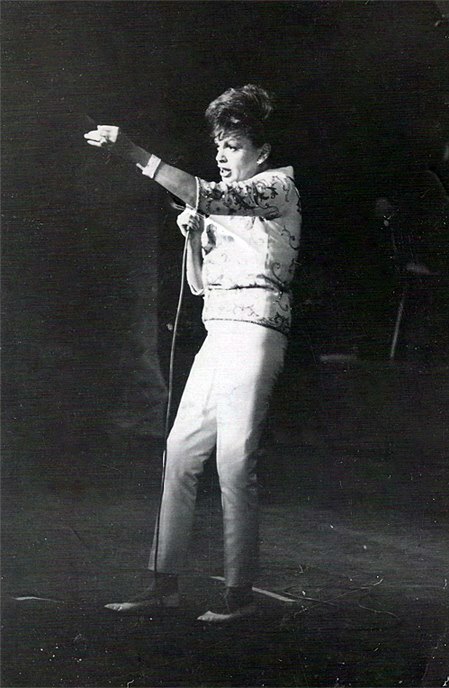 December 3, 1961: Judy performed at the O’Keefe Center, Toronto, Canada. The 3,211-seat hall was standing room only. She gained raves for her performance. Judy returned to the O’Keefe on December 5th, which was also standing room only. 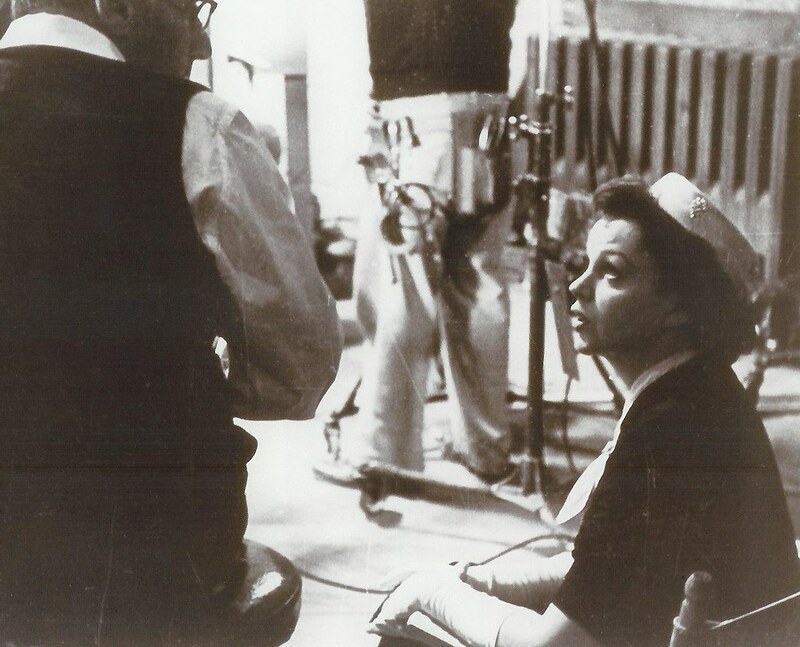 December 3, 1968: Judy was allowed out of the hospital (Peter Bent Brigham) for dinner. John Meyer picked her up at 7 p.m. and they dined at Anthony’s Pier Four. 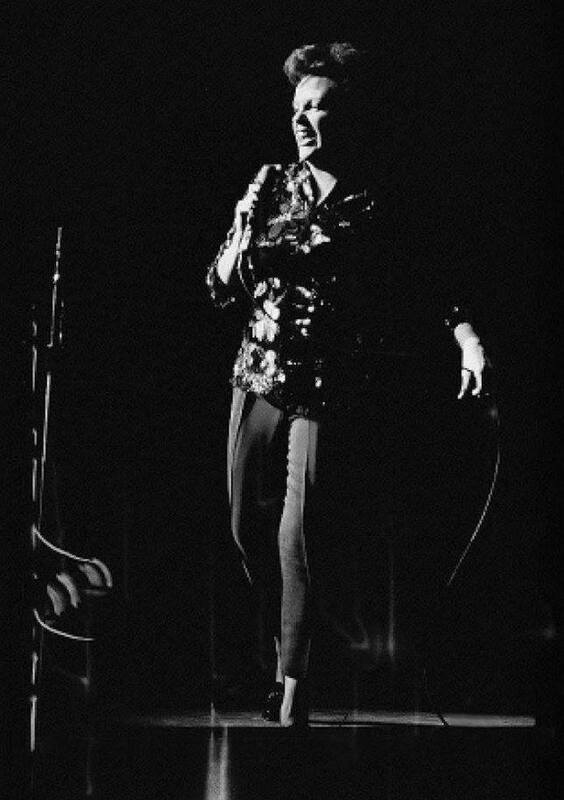 Photo: Judy at Pier Four (in Boston, Massachusetts) on September 5, 1968. 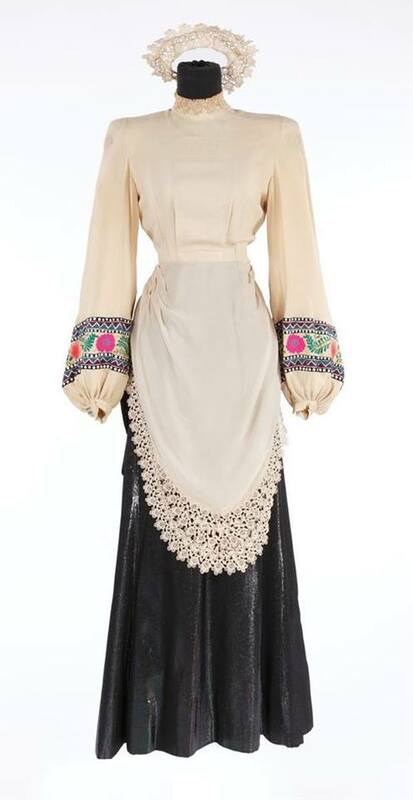 December 3, 2011: The second of the two auctions of items from the amazing collection of the late Debbie Reynolds took place. 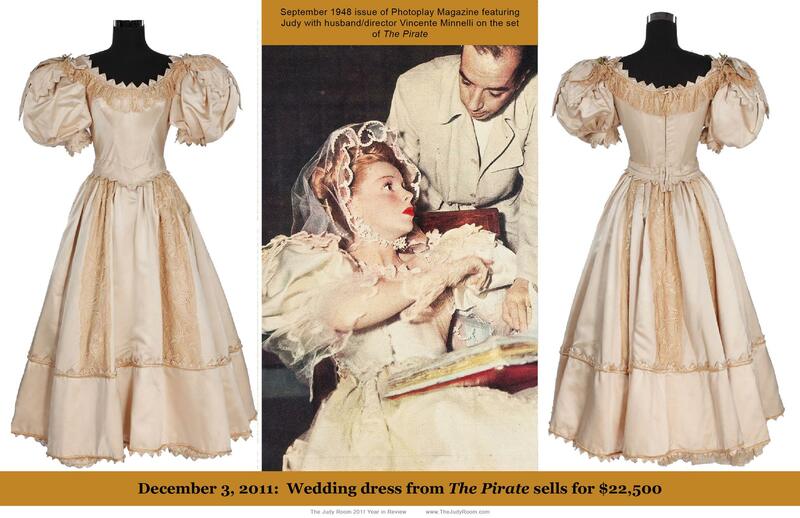 Among the Garland items up for auction was the amazing wedding dress designed by Tom Keogh that Judy wore in The Pirate, and one of Judy’s costumes from Presenting Lily Mars. Check out The Judy Room’s 2011 Year in Review (PDF) for details about both auctions, as well as a few others. Just saw an ad for a new Neil Young album, “Songs for Judy.” The track listing doesn’t reveal any connection between our girl and the songs, but that’s her face on the cover. Anyone know anything about this? Perhaps he’s just a fan and wanted to pay tribute? I saw a post on Facebook about it a little while back, but I don’t know anything about the release or his connection. Maybe he’s a fan and wanted to pay tribute to her in his own way? Thanks for the follow-up, folks! Interesting indeed how she always stays relevant!